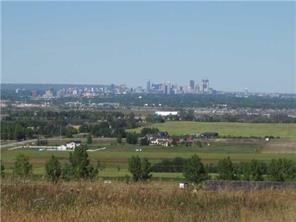 Stunning Rocky Mountain Views and City View! Total of 3.91 acres, fully serviced walkout, estate lot (drilled well, underground power & natural gas) Paved internal road to approach each property. BRING YOUR OWN BUILDER. Fantastic country estate development close to world class golfing, equestrian centres, schools, shopping, Deerfoot Trail plus close to the city and Okotoks! Come and see the incredible views today.